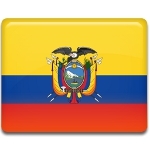 The residents of Ecuador annually observe Battle of Pichincha Day on May 24. The battle took place on the slopes of the Pichincha volcano next to the city of Quito on May 24, 1822. The Ecuadorian War of Independence started in 1820 and lasted till 1822. The Battle of Pichincha was the very last armed forces affair, that brought independence to the Spanish colonies. The Spanish forces were defeated by a Patriot army under command of General Antonio José de Sucre. Sucre opened a campaign for liberation of Quito in January 1822. He formed an army of approximately 1,700 men and marched on the city of Machala. The army of Royalists avoided the battle with Sucre's Patriot army for a long time, nevertheless, the final battle took place on the slopes of Pinchina. Battle of Pichincha Day is observed by numerous parades, organized by school students. The students honor their country and its history. Large military parades are also performed in the largest cities of Ecuador. These parades attract tourists and locals alike. Air force show is organized near Pichincha itself.